“But how can I take you out for coffee if you don’t drink coffee?” my favourite cousin would whine. Working as a barista at Marco’s or running a coffee shop, coffee was more than a frivolous pastime for her. Coffee, hot or iced, is an essential part of her day. I clearly remember the day I accidentally fell in love with coffee. My boyfriend and I had been riding around the back roads of Korea and had finally stopped at a restaurant to eat some lunch. We removed our shoes and stepped up on the raised wooden platform and sat on square, flat pillows. After we ate a delicious bibimbap meal, a paper cup filled half full of coffee appeared in front of me. “Oh! Sorry!” my boyfriend apologized. “I forgot to tell them that you drink tea, not coffee. Do you want me to tell them?” Hating to cause a fuss and waste it, I decided that a half-glass of coffee (no more than three swallows at most) would probably be manageable. It was delicious. I couldn’t believe it. It was sweet and hot. The slick it left on my tongue was reminiscent of chocolate. And it left me wanting more. From that day on, I branched out. The best way to do this was by signing up for “Coffee Tuesdays” at my school. Paying the equivalent of $5 weekly in advance allowed me to get a cup of whatever Starbucks delivered each Tuesday. Sometimes it was white mocha or sometimes it was latte. I began to learn what stronger coffee tasted like and how to add sugar or milk to make it work for me. Then my boyfriend got a coffee maker and we started having coffee on mornings we really needed the extra boost. People gave us coffee grounds for gifts so that gave us more reason to make coffee. Now we are living in Toronto, usually we have one cup in the morning with our breakfast and then some kind of tea after our dinner at night. So I will have to say Korea opened my mind to the yummy goodness that is coffee. Other tastes I acquired while living there were mushrooms, eggplants and garlic. So good!! Before I didn’t go near them but now I love them and look forward to seeing them in the dishes I eat. Now I’ve left Korea, I await in anticipation of the culinary changes the country of Canada will bring me! What tastes have you acquired since you've "grown up?" 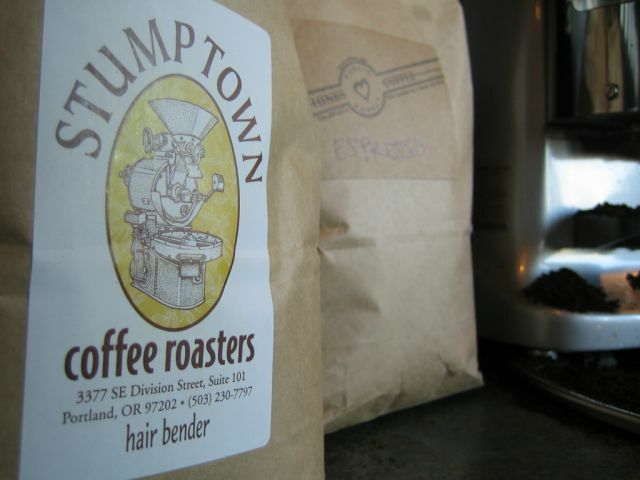 *Danifesto Update: For Thanksgiving my cousin gave us a bag of coffee beans from Stumptown, a company known for good coffee. So this gift required us to break down and buy an actual coffee grinder. We found one cheap at Honest Ed's (a Toronto institution) on the edge of Koreatown. Haven't tried it out yet but looking foward to freshly ground coffee in the mornings! I miss our Starbucks Tuesdays, Dan. I will think of you when I have my coffee in the morning! food! One of my favourite things ... the best new discovery for me has been fresh pineapple! As a child in New Zealand we have access to a truck load of amazing fresh fruits and veges. Pineapple was imported and therefore a luxury. I never really liked it or aquired a taste for it. Most of what I had was not fresh and the canned stuff was not nice at all. I was in Chiang Mai a few years ago and we stopped at a road side shack for lunch after rafting. Afterwards we were served a variety of fresh fruit - most I could take or leave but when I had the pineapple I just about fell off my chair. It was so sweet, tangy and juicy ... It was all I could do not to fight off everyone else with my fork! Pineapple is now my favourite fruit and a whole pineapple is cheaper for me than 2 apples in Korea so it is one of things that I buy regularly. I'm so excited that you have embraced the goodness of coffee. I've never had the aversion to the taste like so many folks have. Mom would always let us sip on her coffee when we were kids. We would get a small cup of coffee on very special occasions. It was always such a treat for me. In high school, I drank it regularly before my first job at Marco's. Then at Marco's there was always the endless contests of who could drink the most straight shots before turning green. So it's not surprising that it became a daily habit. I had no idea that you didn't like mushrooms, eggplant or garlic. All are favorites of mine. As for foods I've embraced in my later years; sushi is the only real thing that comes to mind. It definitely took several tries before I began to love it. Raw tuna (texture)used to creep me out. Now I can't get enough of it. Good post! It was nice to walk down the coffee memory lane. Dan, I recently attended the SCLA Conference in Hilton Head, SC and there was an exhibitor's wine reception. Now, I've tried wine MANY times. I've even been to Napa Valley and sample some of the best stuff and still couldnt' grasp why anyone would enjoy the bitterness of it. But this reception was only wine (and cheeses, crackers, crap dips, etc) and it was free. So I took a glass. I decided I would be a big girl and try to get it down. So, at 34, I finally have decided that wine is ok and that I may just have it more often. Oh danny boy~ Why do I like you? Why are we friends? Why? Why? Why?!! Because reading your blogs, I can tell that basically we grew up in the same environment. We had the same experiences & we had our share of pains and confusion being a badingding christian. I havent told you that my father once studied and was trained to become a pastor so I guess that qualifies my dad to be like your dad too. ok ..about coffee..heres my story..There are two beverages my meticulous, critical, nosy mother told us never, never to drink. First is coke (or any soda for that matter) and coffee for reasons your mother also told you. Also, she said coffee doesnt add up to make you beautiful. Oh yes, my mother was bitchy I gotta tell you sister. Second is never drink sodas because not only it has caffeine, you are actually drinking sugar she said adding that her sisters in the states are all obese hippos. She suspected its all because of softdrinks. I think so too. so up to this day I dont drink coke or sodas and that I think is the secret to my fighting form figure. It is only in Korea that I learned to drink coffee. And I drink a lot too. Who wouldnt be tempted not to? With coffee vending machines everywhere and coffee shops only a stone's throw away from where you are standing. Honey believe me this side of the planet is coffee crazy. I just avoid coke. But I drink coffee now. My mother was very health conscious. Thanks but no coffee to her. She died of cancer at the age of 50. And so, because of that....I-AM- drinking my coffee.